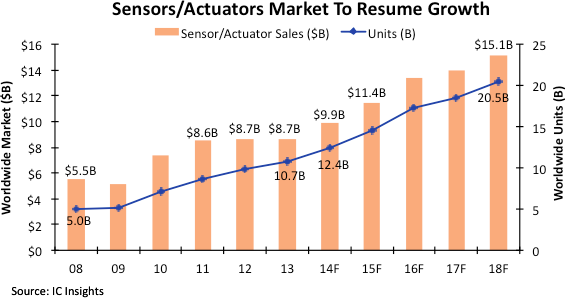 IC Insights has forecasted the worldwide sales of sensors and actuators to grow 14% to a new all-time high of $9.9 billion in 2014, followed by a 16% increase in 2015 to $11.4 billion. Inventory corrections in some cellphone segments, falling average selling prices (ASPs), and delays of purchases by cautious system makers caused the sensors/actuators business to stall out in 2013 with total revenues increasing just 0.3% to slightly more than $8.7 billion, but a new wave of stronger growth is expected to begin in 2014 as the global economy improves and new systems applications rejuvenate sales (Figure 1). Between 2013 and 2018, the sensors/actuators market is projected to rise by a compound annual growth rate (CAGR) of 11.7% to reach $15.1 billion. Market growth drivers suggested are new multi-sensor smartphone platforms, wearable systems (such as smart watches, wireless medical devices, and personal activity trackers), “Internet of Things” applications, radio-frequency filtering actuators, pocket-sized projectors built with micro-mirror devices, laboratory-on-chip testing tools for drug, disease, and DNA analysis, microphone chips, fingerprint-identification sensors, and more automotive sensors for higher levels of safety and automation of driving. In 2013, total sensor revenues grew by a below-average rate of 3% to reach a new record-high $5.4 billion compared to about $5.3 billion in 2012. Since 2003, semiconductor sensor sales have increased by a CAGR of 13% but growth rates have slowed in recent years. In 2013, revenues grew in two of the four of the sensor product categories. Pressure sensor sales strengthened significantly in 2013, climbing 16% to a new all-time high of $1.3 billion due to new measurement applications in smartphones and other portable systems, medical equipment, embedded-control applications, and healthy growth rates in automotive markets. However, acceleration/yaw sensor sales (for accelerometers and gyroscope devices) declined 2% to slightly less than $2.5 billion in 2013, while revenues for magnetic-field sensors (including electronic compass chips) fell 1% to $1.4 billion in the year. Built with MEMS technology, acceleration/yaw sensors—the largest sensor category in terms of dollar volume—had not suffered a sales decline since 2005. Magnetic-field sensors—the largest unit-volume sensor category and second in dollar sales—had grown by double-digit annual percentages between 2010 and 2012 after declining 22% in the 2009 downturn. Meanwhile, the large-but-eclectic actuator product category declined 4% in 2013 to about $3.3 billion after dropping 10% in 2012. New record-high sales are expected to be set in pressure sensor (+18% to $1.6 billion), acceleration/yaw sensors (+14% to nearly $2.9 billion), and magnetic-field sensors (+13% to $1.6 billion). The actuator category is projected to end its two-year sales slump in 2014, rising 11% to about $3.6 billion.